Dig into South America’s most inspiring destinations on this tour to Machu Picchu and the Galapagos Islands. Peru marks the first stop on this extraordinary adventure. In Cusco and the Sacred Valley, you’ll explore the places where South America’s most powerful civilization took root and flourished. You’ll visit a series of Inca ruins, each more stunning than the last, arriving finally in Machu Picchu, the most awe-inspiring of them all. Ecuador is the second stop. You’ll land in Quito for a night, and then depart to the Galapagos Islands, where you’ll board a cruise to discover the archipelago’s natural wonders and remarkable wildlife. 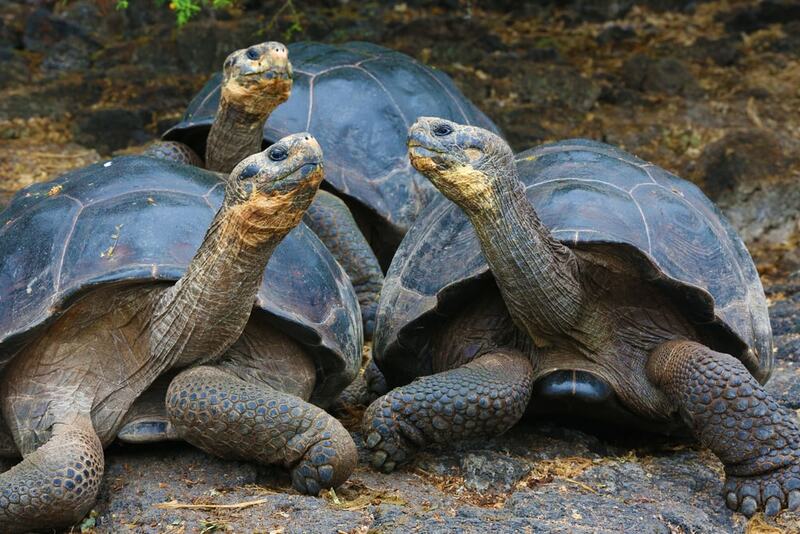 From grunting tortoises to fantastic lava formations, the Galapagos will engage all your senses as you take in the strange and marvelous sights of this unique destination. After breakfast, transfer to the airport for your flights from Cusco to Lima to Quito. Upon arrival in Quito, meet our representative for a transfer to your hotel. Explore Quito at your leisure. The colonial-era city center is particularly well-preserved and, in in 1978, became one of the first UNESCO-recognized heritage sites. In the evening, meet our representative at your hotel for a briefing on your Galapagos Cruise. 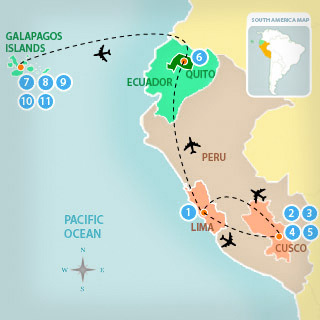 Transfer to the airport for your flight to the Galapagos Islands, located 1,000 km off the coast of Ecuador. Meet our representative on arrival for a transfer to your cruise ship. Settle in to your cabin and then meet your naturalist guide for an explanation of your cruise itinerary for the next few days. Your exact itinerary will depend on the boat you’ve chosen, but you’re guaranteed to enjoy exceptional wildlife viewing both on land and in the water. If you’re interested in activities such as snorkeling and scuba diving, be sure to inquire before booking a ship. The volcanic archipelago that inspired Darwin’s theory of evolution showcases unusual wildlife including giant tortoises, marine iguanas, lava lizards, blue-footed boobies, and Galapagos penguins, not to mention an incredible concentration of species that live in the sea. Enjoy a final breakfast aboard your ship. Upon arrival at the port, disembark and meet your transfer to the airport to begin your journey back home or on to your next destination. Budget tours are designed to offer the best value and comfort possible, and have some variations compared to our 3, 4, and 5-star packages. Call or email us to learn more about our Budget tours.